Born out of love for teaching music, sharing knowledge, and passion. Robert Smith took up the torch of Music Makers and used the opportunity to refresh the business both aesthetically and philosophically. Finding points of differentiation to make Music Makers stand out from their competitors would be critical to their next chapter of success. Several meetings later, it was obvious Music Makers promoted more genres than just rock and roll like the other schools. They also centered around progress and personal goal setting. Finally, they focused on what the students wanted to learn and built the lessons around those interests. Up there in the spotlight. 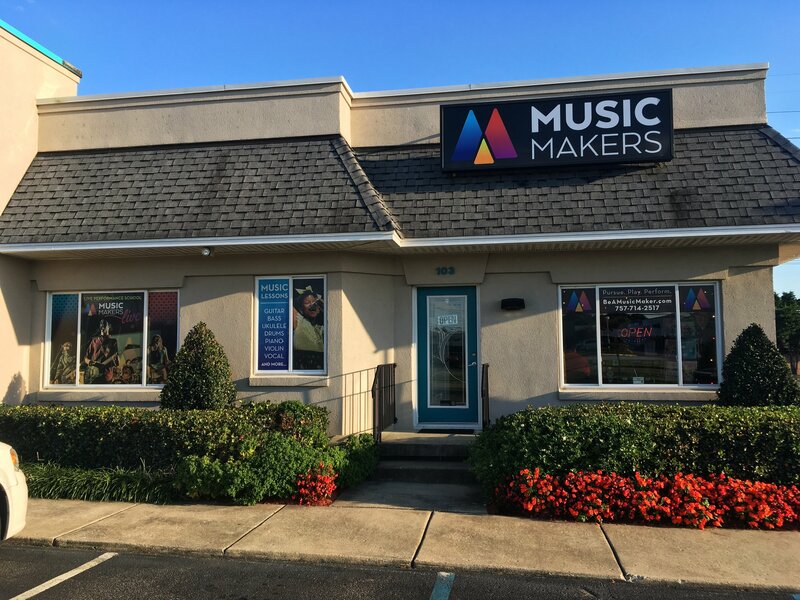 While many other “rock schools” focused on rock and roll imagery, Music Makers emphasizes the experience of performing any genre of music. The spotlights borrow colors from stage lighting and the two overlap creating an abstract “M”. The three pieces of the logo represent the three pillars of Music Makers: Pursue. Play. Perform. It’s always difficult to carve out a presence online. In the process of reinventing themselves, Music Makers wanted something better than MusicMakersVB.com. They wanted something that was a call to action. After exploring different options, the solution was found back in the new tagline of “Pursue. Play. Perform.” They wanted people to “Be a Music Maker”, and BeAMusicMaker.com was born. The website continues the metaphor of being up on the stage. Bright colors are used to highlight and call out information, and the photography is largely pulled from Music Makers’ live shows. The same sense of energy the performers bring to the stage are present everywhere on the site.